Song is second-generation truth, extracted from scripture. Scripture is the fountain of God's truth, the source of who He is. Scripture has a power that song can never attain. When song and scripture are working in tandem, they provide a powerful one-two punch. Our hearts are prone to idolatry. God is forced to compete with that which we value, and hold onto tightly, and are engrossed in. (1 Corinthians 7:31) And he has said that he will not share his glory. God requires of us repentance. "Repent," he says in verse 6. Turn, and renounce your previous mindset and habits. Scripture is God's unique worship resource that aids us in our worship of Him. It shows us who God is and what he is like, and at the same time shows us ourselves and what we are like. 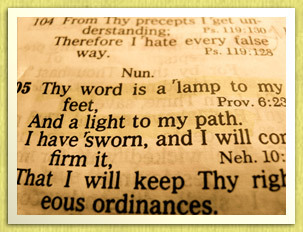 The Bible is "...the heart of God in the words of God." "I am lost in amazement as I contemplate God the lover. The Bible is such a love letter. And the universe is so pressed down and running over with love." I am the creature of a day, passing through life as an arrow through the air. I am a spirit come from God and returning to God; just hovering over the great gulf; till a few moments hence I am no more seen; I drop into an unchangeable eternity! I want to know one thing, the way to heaven; how to land safe on that happy shore. God Himself has condescended to teach the way; for this end He came from heaven. He hath written it down in a book. give me that book! At any price give me the Book of God! Lord, is it not Thy word--"If any man lack wisdom, let him ask of God? You give liberally, and do not upbraid. You have said, if any be willing to do Thy will he shall know. I am willing to do; let me know Thy will."